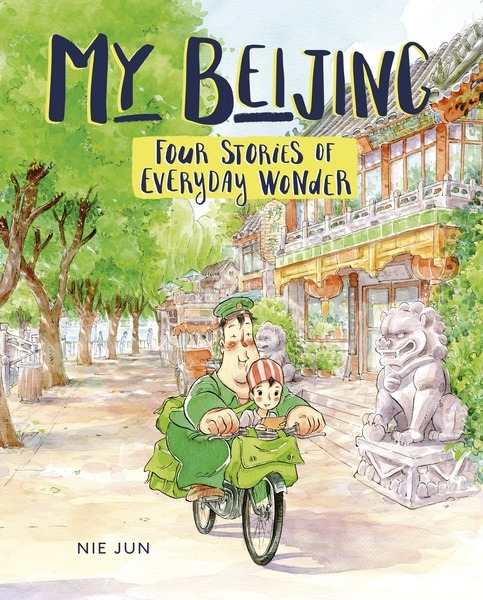 My Beijing: Four Stories of Everyday Wonder is a magical watercolour children's book by Chinese master cartoonist Nie Jun. "A young Chinese girl and her grandpa navigate life's challenges and joys in a small neighourhood [known as a hutong] of Beijing. In this graphic-short story collection, the author introduces readers to Yu'er, a girl with an unspecified physical disability that limits her mobility, and her loving grandfather. "The first story opens with her dream of becoming a champion swimmer and a belief strong enough to carry her above her naysayers. From there, readers meet a boy who helps her fight off bullies, encounter the fantastical properties of an old mailbox, and finish by witnessing Yu'er's reconciliation with a grumpy neighbour." The Lerner Publishing Group had BLOOM's questions translated into Chinese, so that Nie Jun could answer them. His responses were then translated back into English. My Beijing is Nie Jun's first book published in English. We are thrilled to bring you his words. 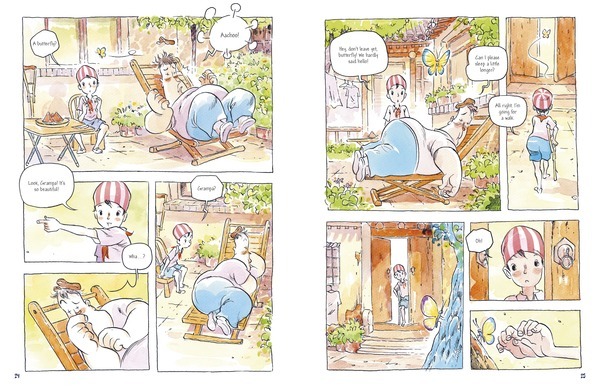 BLOOM: How did you get the idea to include a character with a disability? Nie Jun: In this book, Yu'er is very brave and self-confident. Her biggest difficulty in achieving her dream is her disability. But such a situation can make more people identify with her inner confidence and optimism, and also make the relationship [between] her and her grandpa warmer and more dramatic. BLOOM: Is Yu'er based on a real person? Nie Jun: When I was a child, I lived in a large courtyard house where many families lived. There were many children jumping up and down on the colourful roof. There was a child with physical disabilities in the neighbourhood. I remember that her mother used to take her to the street to sell small groceries. Her mother usually hid somewhere far from her and watched. At that time, we often tried to tease the girl and deliberately anger her. Looking back now, I think her mother was training her to survive. In contrast, we so-called normal children were doing some boring things while she had already learned to face life. This memory affected my understanding of Yu'er. BLOOM: The theme of the injustice of exclusion comes out in your book—whether Yu'er is excluded from taking swimming lessons, or the butterfly's wing is ripped off by the bullies, or Pumpkin can't get the art buyer to see the value of his work. Did you want readers to see the fragility in all of life? Nie Jun: There are many injustices between people. Especially when it comes to a weak person, the strong group will psychologically exclude or even expel them. This is human nature. Based on this view, I prefer to show a peaceful way of getting along in the story. People don't show a deliberate pity or give preferential treatment to Yu'er. They don't regard her differently from others. This way of getting along makes Yu'er feel happy and makes her heart sunnier. I also hope that everyone can see a kind of reconciliation in the story. Yu'er's beautiful swimming makes the children who once laughed at her exclaim with admiration. Yu'er is not sad because the children bully her, but she cries for the broken wings of a butterfly. Although Pumpkin can't get the art buyer to take his work, in Yu'er's eyes, he is greater than any master of art. He finds a true respect. BLOOM: Grandpa is the hero of the story. He has endless imagination and sees the good in everyone. In Western culture, seniors are often devalued. Why did you want the hero of the story to be a senior? Nie Jun: Grandpa is a typical old Beijing native, warm, kind, and humorous. In a Chinese family, the seniors are more willing to share their children's pressures in life, such as caring for grandchildren. This can also reduce the loneliness of the seniors. This kind of relationship makes the grandparents and the grandchildren dependent on each other, which is very normal in a Chinese family. For example, when I was a child, my parents worked in another city for a long time. During this time, I was living with my grandpa. At the very beginning, we did not get along well. But as time went by, we became close. For me, this kind of family love is worth recreating. BLOOM: We see Yu'er using a crutch or being pushed in a cart or carried on Grandpa's bike, but we never see her in a real wheelchair. Is there a reason? Nie Jun: I really have to explain that: a wheelchair is very inconvenient in the old Beijing streets. The gates have high threshholds. There are also many stone steps and no elevators. That's why Yu'er usually uses a crutch. And the cart she is pushed in is not like the cart we see in supermarkets. In Beijing, we call it "Dao Qi Lv (riding a donkey in reverse)." It's a kind of common bike with a cart in front of it, and it's very convenient. This design is more like the rest of what you see in the old street, and it makes Yu'er's life not that different from others. I hope that in the eyes of readers, she is a very cute and ordinary little girl who grew up in a hutong. BLOOM: At the end, Pumpkin gets a second lease on life when he begins teaching Yu'er how to paint. What do you learn from your students? Nie Jun: I am now working as a visiting teacher at the Beijing Film Academy every Tuesday afternoon. Mainly I discuss the creation of comic stories with my students, from how to write a scenario at the beginning, to how to finish the whole work. In the process, I've learned that a creator should never discard curiosity about the unknown world, even if your guess is very wild or might disappoint you when you contrast it with the real world. As you mature and your knowledge increases, you will find the difference between your imagination and reality becomes smaller and smaller. It may be a good thing, but it also means that a creator can become more cautious. So maybe the most precious thing for a creator is always keeping a childlike curiosity. Just like what Pumpkin said when he saw Yu'er's work, it has a moving, innocent power. BLOOM: What ideas about disability do you hope children take from the book? Nie Jun: An equal relationship is the most important thing. Do not treat people with disabilities with exclusion or pity. Step past your differences, learn from each other's heart. BLOOM: As this is your first book in English, what ideas about China do you hope readers take away? Nie Jun: I am very happy to have the opportunity to publish the book in English. I haven't been to America or Canada yet, but it makes me feel so excited that my work can be seen by more people (and special thanks to my agent, Mr. Wang Ning, who has given me a lot of help in these years). Although we are in different cultures, I believe that readers could feel lots of common emotions from the story, and I hope people who read this book could have a chance to visit China. Beijing is a city full of stories; it has a long history but is also developing rapidly. For this reason, the values and living standards of people here are making interesting changes. But I hope that through the story of an ordinary family in the old street, we can see those unchanging feelings and love for dreams.